Many people have an investment option available in your 401k plan that they have never considered using, but should. It goes by many names: Stable Value, Fixed Income Fund, GIC (Guaranteed Investment Contract), Capital Preservation Fund, Principal Protection Fund, Fixed Interest Fund, Guaranteed Fund, or Stable Interest Fund. All of these types of funds can be grouped under a category called stable value funds. Stable value funds are composed of investment contracts issued by banks and insurance companies. Each investment contract pays a specified rate of return for a specified time period. It is an investment option that is only available within tax-qualified plans, meaning that you cannot purchase this investment in an IRA account or in your brokerage account nor can you find a stable value mutual fund that you can buy outside of your company retirement plan. The objective of stable value is to preserve your capital and provide liquidity while delivering returns comparable to those of short or intermediate-term bonds, but with less volatility. Stable value is considered a low-risk investment choice. Someone who is quite conservative might choose it for all of their money. Someone who is concerned about stock market volatility might choose it for a portion of their money. 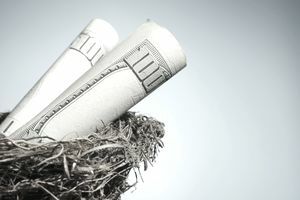 It is a particularly appropriate choice for those who are within five years of their anticipated retirement date. An investment option like stable value is quite useful for someone who is near retirement. Let’s assume you are three years from retirement. You have put together a retirement income plan that shows you that you will need to withdraw $30,000 from your retirement accounts in your first year of retirement. If you invest that $30,000 in stable value now, you will know it is available for you when you need it. If the market is down between now and retirement so what? You will know the amount you need to withdraw is secure in a stable investment choice. If you are going to use this option it is important that your 401k plan provider allows you to pick and choose what investments you take withdrawals from. Some 401k plans make you take withdrawals pro-rata, meaning they must come proportionately from your various investments funds. If you want to match your investments to your withdrawal needs you’ll need to be able to pick and choose what to sell when it comes time to take money out. Even if your plan does not allow you to pick what to sell when you take retirement withdrawals, stable value can still add stability to your portfolio, and the closer you get to retirement, the more stability you want. Most people should actively manage their investments, but if you do you can use stable value as an opportunity fund. As your growth investments (equities) go up, you would take those profits and move those into stable value. Then when the equity market goes down you can move money from stable value back into growth. There is no guarantee this approach will deliver returns any higher than following a strategic asset allocation model. As a matter of fact, many investors have ill-timed decisions when they attempt this. For those who will be needing withdrawals soon, the advantage of stable value over a short or intermediate-term bond fund is the lower volatility. Or, in other words, a good return on your investment is the return of your investment. As you get closer to the point in time where you will be taking withdrawals this becomes increasingly important. If you could buy individual bonds or CDs inside your 401k plan, that would be a good choice as those investments secure your principal and you could use them to create an income ladder or bond ladder. As those choices are not available in a 401k plan, then stable value becomes the ideal alternative. What Rate of Return Can You Expect to Get From Safe Investments?